Now fully revised and expanded, Edison in the Boardroom, Second Edition takes an in-depth look at the revolutionary concept of intellectual asset management (IAM). Incorporating stories and teachings from some of the most successful companies in the world—such as Hewlett-Packard, IBM, Procter & Gamble, Rockwell, Dow, Ford and many others—Harrison and Sullivan have made an exhaustive study of IAM and its implications for today's businesses. 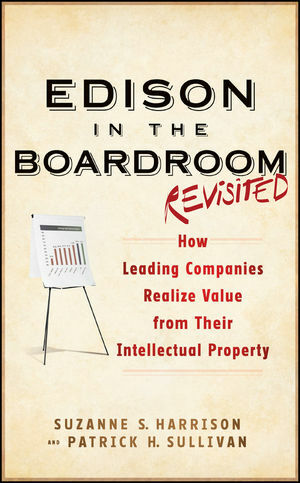 Edison in the Boardroom, Second Edition compiles a wealth of knowledge and successful stories that illustrate how far businesses have come in their ability to leverage and monetize their intellectual assets. SUZANNE S. HARRISON is a cofounder and Principal in Percipience LLC, a board-level advisory firm focused on intellectual property strategy and management, quantifying and mitigating IP risk, increasing IP value capture and focused innovation. She is also the convener of the ICM Gathering, a group of global companies that has been meeting since 1995 to define, create, and benchmark best practices around Intellectual Property Management (IPM) and other intangibles (I-stuff). An intellectual property expert testifying on both damages and IP management activities, she has written numerous articles and is coauthor of Einstein in the Boardroom, also published by Wiley. Dr. PATRICK H. SULLIVAN is an expert on extracting value from intangibles. He has pioneered the development of methods and practices for analyzing, valuing and managing intangibles for business purposes. He has consulted with over 1,000 companies on issues related to value extraction and valuation. He is a court-approved expert on valuing intangibles and has pioneered the development of valuation methodologies specifically for intellectual property. He is a frequent speaker and has published several dozen articles on valuation and value extraction. His other books include Technology Licensing, Profiting from Intellectual Capital, Value-Driven Intellectual Capital, and Einstein in the Boardroom, all from Wiley.